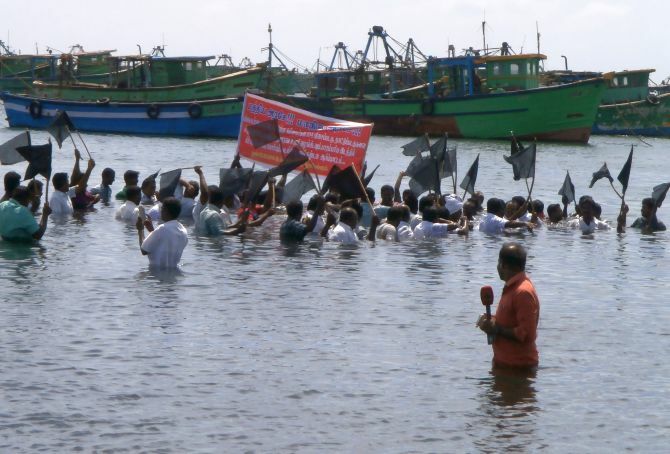 Fishermen in Tamil Nadu staged a unique protest on Friday at the Rameswaram jetty demanding that their boats be returned by the Sri Lankan authorities. Rediff.com’s A Ganesh Nadar was at the scene of the demonstration. “Wake up, central government, wake up, state government”. “We will fight till we die”. “We will struggle till we get our boats back”. 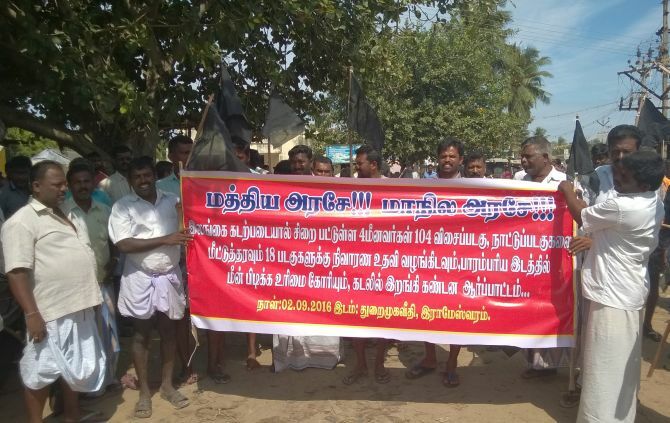 Slogans like these could be heard from around the Rameswaram jetty on Friday as fishermen belonging to 11 different unions gathered to demand the release of their boats from the custody of Sri Lankan authorities on September 2. For those who think it was a regular agitation, think again. These fishermen were standing in chest-deep sea water for over an hour, raising slogans and demanding the release of their boats -- their livelihood. The Lankan authorities have around 108 Indian fishing boats in their custody, which fishermen dispute as unfair. Protesting this injustice, the fishermen gathered around 9.30 am even as a number of policemen also assembled to ensure that law and order was maintained. A boat belonging to the Indian Navy and the Coast Guard was also present. Soon, the fishermen were in the waters and one could a see a banner which read ‘release 108 boats from Lanka’. A year ago, at a public rally, Radhakrishnan had promised the fishermen that he would retrieve their boats in a fortnight. The fishermen are still waiting. Another slammed External Affairs Minister Sushma Swaraj for making promises but failing to deliver. A third leader said they were better off under the Congress government, as they had better ties with Sri Lanka and always got their boats back. After an hour of continuous sloganeering, the fishermen, drenched and tired, called off their agitation. Besides this agitation, one of the union leaders will also launch a fast unto death on September 12. He added that the 1974 accord with Sri Lanka clearly states that fishermen from both countries can fish around Katchatheevu but the Lankans are disputing this and India does not object. He adds that things changed for Indian fishermen in 2009 when the ethnic war came to an end. “Earlier, during the war, the Lankan fishermen didn’t venture out into the waters. However, after the war ended they started fishing and that’s when they began to complain that we were stealing their catch. However, one thing this correspondent couldn’t help noticing was that even as these fishermen protested, another group returned from the sea with their catch of the day. Is India-Sri Lanka fishing row nearing an end?